Ah, the omnibus. Many trilogies I would never had read if they'd not been released in omnibus form. It's three books for the price of one and a bit! Frankly, you'd be losing money if you didn't buy it! (Or so I tell I tell my boyfriend when yet another parcel of books appears on the doorstep...) If I'd had to have purchased the three books in the Castle trilogy, The Year of Our War, No Present Like Time and The Modern World, I know I never would have. I mean, the plot sounded intriguing enough. An emperor dude has the power to make people immortal, but he grants the gift only to the man or woman that proves themselves to be the indisputable best at something. But you can't, like, be the best at ribbon curling, your skill has to be relevant to the centuries long war the emporer's been waging against an invading swarm of bugs. Jant is the best messenger at the world, because he's pretty good at learning new languages and diplomacy, but mostly its because he can fly and no one else can. Which seems a bit like an unfair advantage to me but there you go. Sounds pretty cool, yes? But there were several things that turned me off. Firstly, Jant is a drug addict, hooked on a hallucinogenic called Cat. Man, I hate reading about drug addiction. Partly because I find books (and movies too) that deal with addiction tend to be too dark for my liking but mostly, having never been a drug addicit myself and therefor having no understanding of what it feels like, I get really frustrated. 'Hey, character x, have you tried just, you know, not taking drugs?' Also, the trilogy has garnered some pretty average reviews, the most troubling being that the characters are shallow and boring. But, omnibus! So I bought, I read and, friends, I loved it. Loved it like my niece loves pink. (And believe me, the kid loves pink). Are the secondary characters somewhat 2d? Well, yes, but, but, I think that's the point. Because Jant, our erstwhile first POV narrator, is just a wee bit self centered. If the people around him seem to lack depth its because he's too busy checking out his reflection in the mirror to notice their depths. It obvious that Swainston is capable of writing fleshed out and complex character because that's exactly what Jant is. There are three races in the book, humans and "Awains" (who are pretty much people with wings (who can't fly)) are the two who co-exsist quite happily and who we see the most of. But then there are the Rhydainne, (I may be getting the spelling wrong here, my book is out of arms reach), an odd race who live way up in the snowy mountains. They are extemely fast and insanely self serving. Their language doesn't actually have a word for "we," but it does have over fifty for drunk. (Jant says this is because it gets too cold they need to drink to stop their blood from freezing, but Jant says a lot of things...) Humans and Awains are very distrustful of Rhydainne, and so Jant often gets treated with suspicion or fear, on account of he's half Rhydainne half Awain. (This is how he can fly, super light Rhydainne bones combined with Awain wings). Jant is a fascinating mix of both cultures. He craves acceptance and love, but at the same time his solitary Rhydainne nature shines through. He has a wife, for instance, but the only time he seems to think about her when she's not with him is when she's having an affair. And then it's only about how Jant feels, and not at all about her. He constantly twists situations around to serve himself, and has a constant stream of excuses ready to explain why he's never wrong, especially when he's taking drugs, and he's kinda always taking drugs. Dugs which, I haven't yet mentiond, teleport him to another world which reads like something China Mieville wrote and then decided was too weierd. The drug taking didn't bore as much as I expected it too, or even at all. I think Jants wicked sense of humour played a huge part in it, he kept taking drugs and screwng up and I just kept on forgiving him. 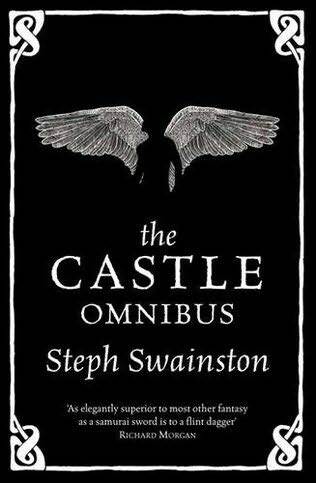 Plus, Swainstone's descriptions of flying make it sound like just the coolest thing ever. There's something vicariously enjoyable about the constant envy Jant receives because he can fly. The plot? Hmmm,well, ok. A lot seems to happen, but then you stop and think and realise that actually, nothing has happned. It also gets a little confusing at times, and story elements are set up to be important and then kind of go no where. But I can gaurantee that it will be different from any fantasy you've read before. And honestly, he plot could have been Jant goes to the market to by fruit but buys socks instead and I'd read it, solely because of Jant's voice. 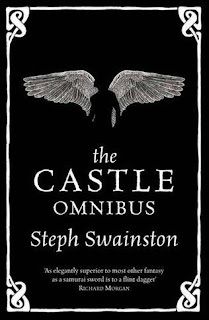 He made the whole trilogy for me, and is the reason I can't wait to get my hands of the prequel and I'm hoping like crazy that Swainston writes a sequel. I really liked The Year of Our War, but I haven't gotten to continue yet. Definitely a good thing that the quality stays up. Also, there is a prequel, Under the Snowline, if you're interested.